Are we running out of invasives? Have we already experienced so many invasive species that we’re exhausting the pool of potential species? We live in a time of global trade, and with this trade of goods we often unwittingly introduce invasive, non-native species. Invasive species are non-native species that get moved from their native place of origin to a new location, establish, and reproduce such that they outcompete native species. They are typically able to thrive in their new environment because they are released from the sources of mortality (e.g. pathogens, parasites, predators, competition, limited resources, or climatic conditions) that they experienced in their native range. In the United States, have we already experienced so many introductions of invasive species that we’re starting to exhaust the pool of potential species? This is a vital question for predicting the future welfare of our agriculture, environment, and society. Invasive species are hugely destructive. For example, kudzu vine is wreaking havoc on the southeast United States. It was introduced in the 1870s from Japan as an ornamental plant, and in the 1930s through 1950s was used to control soil erosion . However, things quickly got out of hand (Fig. 1) and now kudzu has spread to affect over 120,000 acres  resulting in management costs (i.e. herbicide spraying, mowing, and other mechanical removal efforts) of over six million dollars annually . You may also have heard of the emerald ash borer. This is an non-native beetle that was first discovered in Michigan in 2002 and has since spread across half of the United States and Canada. It has been implicated in the death of millions of ash trees and the loss of hundreds of millions of dollars due to the cost of cutting down dead trees, decline of property values, and losses to the forest products industry . The beetle is not intrinsically bad, but in the introduced range in the United States two main things are different from its conditions in its native range in Asia. In the United States, its populations can attack trees that are naive to it and don’t have the same chemical defense that trees that evolved with it have. Also, the beetle populations are not longer under control by the community of parasites in Asian that keep it in check there. The spread of kudzu vine and of the emerald ash borer are just two examples among countless others. A decade ago there were an estimated 50,000 non-native species in the United States  with a 10th of these considered invasive —there are likely many more by now! For kudzu and emerald ash borer, I outlined some of the costs involved. Now imagine those costs multiplied by a battery of new invasive pests…. Clearly invasives are an expensive problem! You might wonder if there can ever be a respite from the introduction of new invasive species. Is the rate of new introductions slowing? Dr. Andrew “Sandy” Liebhold is seeking to understand if we are being bombarded with invasive species at an accelerating, constant, or decelerating pace. Dr. Liebhold, a research entomologist at the Forest Service Northern Research Station in West Virginia, has been working since the 1980s to understand patterns in the spread and outbreak of pest insect species. Insects are particularly problematic invasive species as they are diverse and abundant (thus there are lots of potential invasives to ‘choose’ from), they are hard to detect in either shipments or as new invasives, they can quickly reproduce, and are often herbivores and thus are important agricultural pests. Using large datasets summarizing national and global populations of insects and other species, Dr. Leibhold tested for evidence of a change in the rate of new introductions. The research team predicted that we have experienced the introduction so many native species already that they might detect a decreasing rate of new invasive species as we start running out of non-native species. We know that we have a finite pool of species to draw from, and that only a portion of these species have the potential to establish. We have already experienced thousands of introductions. Maybe we’re running out of invasive species that have the potential to invade? Not likely, according to Dr. Leibhold, who points out that we also have been steadily expanding imports, increasing propagule pressure (number of new individuals introduced). Further, as trade shifts to different products and to interactions with different countries, we experience a whole new ‘market’ of invasive species . In the United States, most species introductions have occurred in the last 200 years as European colonists brought many new mammals, birds, and plants to the continent. Today, novel introductions of insects, algae, mollusks, and crustaceans are on the rise due to increased transport of goods by container ships. Numbers of non-native birds and reptiles are also increasing, a trend attributed to a boom in the pet trade . Liebhold and other researchers find that a few species that were introduced early on and now are under more strict control (regulations on importing them and careful searches of shipments and luggage) show a plateauing or, in the case of mammals, even decreased rate of introduction (Fig. 2). But this is only true for a couple of groups (e.g. plants, mammals, and maybe mosses). Overall, however, there is little evidence for a saturation effect in novel introductions (e.g. see insects and crustaceans in Fig. 2). So unfortunately, no—the rate of introduction shows no sign of letting up! Figure 2. 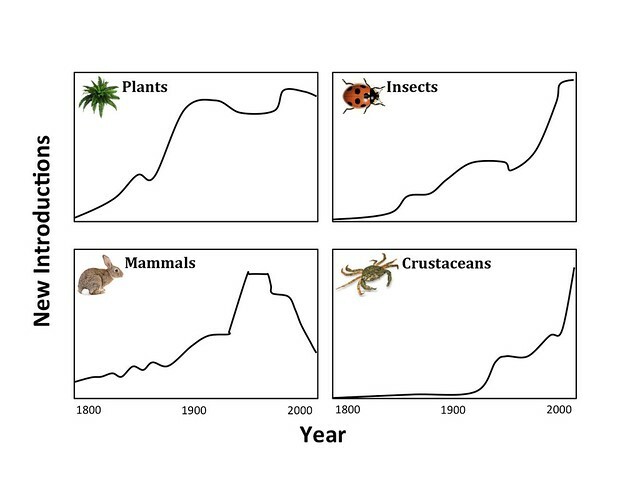 Global trends of different taxonomic groups overall show and increase in new introductions over time. Included here are two groups (plants and mammals) that show a plateau in their introductions and two groups that (insects and crustaceans) that show the trend found in all other groups—an increase in new introductions over time. Figure adapted from Seebans et al. 2017. This research is the first step. To mitigate the effects of accidental introduction of invasives in the future, we need to know (1) what group of species most invasives are (e.g. plant, insect, reptile, fungi, etc.) (2) from where most invasives are originating, and (3) at what rate we are receiving new invasives. With this information we can prescribe future regulations on screening, monitoring, and sterilizing trade goods. While the United States has relatively strict regulations, we know from other countries that additional pressure on regulation goes a long way. For example, when New Zealand enacted the Biosecurity Act, which increased measures to detect and destroy potential invasive species in cargo shipments, it saw significant decreases in new introductions of plants . As a graduate student studying the invasive forest insect winter moth, I have invested my career in studying the effects and management strategies of invasives that have already established in the United States. However, I hope to see fewer and fewer species of concern as my career unfolds. Unfortunately, we can’t expect this to happen all by itself. From Dr. Leibhold’s research, it seems that rates of new invasive introductions will only slow down if the United States follows the lead of other countries and implements more rigorous screening programs for incoming vessels and their cargo. Journey with Nature: Kudzu. The Nature Conservancy. 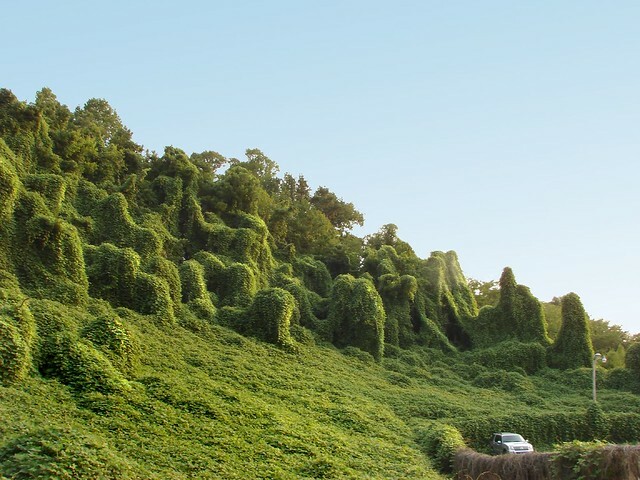 https://www.nature.org/ourinitiatives/regions/northamerica/unitedstates/indiana/journeywithnature/kudzu-invasive-species.xml. (accessed June 17, 2017). Webster, C.R. ; Jenkins, M. A. & Jose, S. “Woody Invaders and the Challenges They Pose to Forest Ecosystems in the Eastern United States” Journal of Forestry, 2006. 104: p. 366-274. USDA/Agricultural Research Service. “Controlling Kudzu With Naturally Occurring Fungus.” ScienceDaily. www.sciencedaily.com/releases/2009/07/090719185107.htm (accessed June 17, 2017). EAB Information Network. http://www.emeraldashborer.info/ (accessed June 17, 2017). Corn, L.C., E.H. Buck, J. Rawson, and E. Fischer. Harmful Non-Native Species: Issues for Congress. Congressional Research Service Issue Brief, RL30123, 1999. Do we have all the data needed to make safe choices about seafood?